Carpet is a funny thing. Some people swear by it for its insulating warmth and cozy comfort on the feet. Others only see it as a trap for dusk and dirt and an allergy nightmare. Whether you’re a fan of carpeting or just stumbled into it through rental or purchase happenstance, if you’ve got it, at some point you’ll have to deal with replacing it. It can be tricky: worn and over used carpet is one of those things that can creep up on you. Yes, good carpet adds warmth and comfort to a room. At a certain point, though, we have to face the fact it needs to be replaced. Comfort and aesthetic appeal and indeed good health require it. Here are some quick tips on when and how to replace carpet, how to buy carpet – along with some do it yourself carpet pointers – to help with your carpet replacement projects. 1. Time to Go: Old carpet can become moldy or trap bacteria and dust. Even those in the family with mild allergies may come to a point where they can’t cope with it any more. Replacing old carpeting isn’t as difficult as it may seem though. 2. Holding Pattern: And carpet certainly doesn’t last forever. In fact, if the quality isn’t very good, carpet doesn’t last long. If entirely re-carpeting isn’t realistic due to budgetary or time constraints, short term solution might be a thorough professional cleaning. Often living room carpet has suffered food spills, animal stains, and dirt tracked in on the family shoes. A thorough cleaning may hold off for a while the immediate need for carpet removal. Ideally, get it cleaned professionally. But if you decide to do it yourself, make sure you do a thorough shampooing. For carpeting, new or old, remember that if stains are treated quickly after spills, chances improve for removing them. 3. Moving on: In many instances, though, the carpet is done for, cleaning won’t help, and it just needs to be replaced. If indeed the carpet does need to be replaced, take some time to do a little research into your options. For instance, consider the use of carpet tile: carpeting that is in the form of squares similar to tiling. It allows you to use different colors patterns to create a unique design. And, in the future, when the new carpet suffers damage, it may prove possible to replace only the damaged tile – considerably reducing costs and time. But, there are other choices as well. 4. 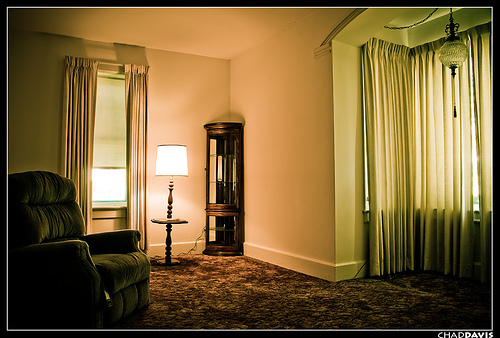 Do you really need it: Just because you’re getting rid of the old carpet, does that mean you really need new carpet? Don’t be too hasty; see what’s under there before jumping into anything. You wouldn’t be the first to discover hardwood floors that, with some care and attention, could be brought up to a beautiful standard and give your home a whole new look. Also, while not to everyone’s taste, with certain minimalist, contemporary design looks, even concrete floors, with the right treatment, can be make the perfect fit for the design style of the home. 5. Making your choice: If you’re committed to making the big change, and carpet is how you’re going to go, a great way to get an idea of what choices are available is to make a trip to a local home improvement store. Most people immediately assume they have to go to a carpet specialty store, but be aware that these can be unnecessarily expensive. You might be pleased to discover that most home improvement stores offer a great variety of carpet options from which you might choose. Plus, many home improvement stores will do the carpet installation for you. You can’t beat that for convenience. When making your decision, be sure to take into consideration as many variables as you can. Textures, colors, and design patterns are all factors that will influence how the carpet looks and feels in your home. It’s always a good idea to get some samples to take home and try some side by side comparisons: how does it match furnishings, how does it look in the room’s natural light, does it provide a pleasant transition from one room to the next, etc. Hope these quick tips on when and how to replace carpet, how to buy carpet – along with some do it yourself carpet pointers –help with your carpet replacement projects.